Hailed as the best of its kind in Ohio, Tuesday Musical’s Annual Scholarship Competition provides valuable support for talented university students embarking on careers as music educators and performers. Twenty college and university music students have received $22,300 through Tuesday Musical’s 2019 Annual Scholarship Competition. Held March 23 in Akron, the 2019 competition drew 130 applicants. Categories included music education, brass, classical guitar, marimba/classical steel drums, organ, piano, strings, voice, and woodwinds. The first and second place winners are invited to perform in Tuesday Musical’s 2019 Scholarship Winners Concert on Sunday, May 19, 2:30 p.m. at Faith Lutheran Church, 2726 W. Market St., Akron. Two additional performance scholarships — one for $1,000 and one for $2,000 — will be awarded during a post-concert reception. The concert and reception are free and open to the public. On-line applications for the 2020 Scholarship Competition will be accepted January 1 through February 1, 2020. Tuesday Musical Association invites all students to attend our concerts at no cost. 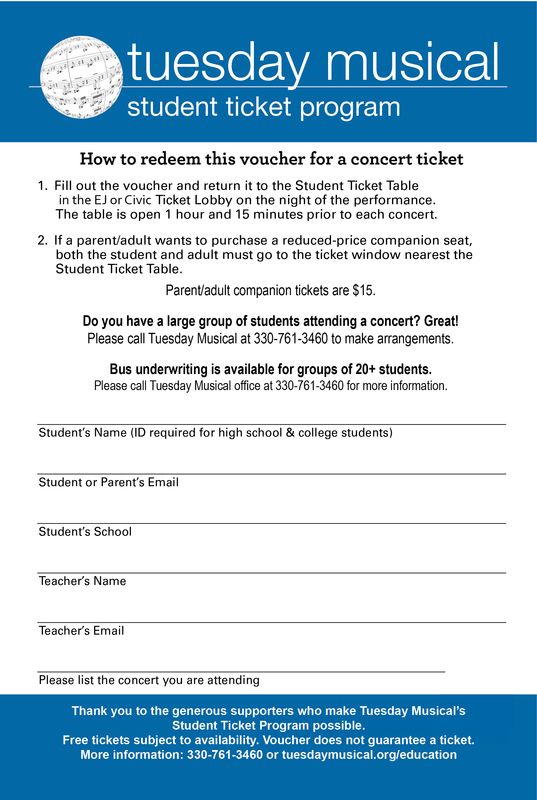 Receive a ticket voucher through your school, a private music teacher, at the Student Ticket Table the night of the concert or the Tuesday Musical office at 330-761-3460. Or, download the form here. Redeem the voucher at the Student Ticket Table located in the EJ Thomas Hall Ticket Office Lobby on the night of the concert. BONUS for parents/adult companions: If a parent/adult wants to purchase a reduced-priced companion seat, both the student and the adult should go to the Ticket Window nearest the Student Ticket Table to obtain both the free student ticket and purchase the adult ticket. Parent/adult companion tickets are $15. Have a large group? Please call the Tuesday Musical at 330-761-3460 or e-mail us so we can process your tickets quickly and conveniently in advance. Bus underwriting is available for groups of 20+ students. Please call the Tuesday Musical at 330-761-3460 or e-mail us. Student ticket vouchers are available by clicking this link. World-acclaimed musicians teach students in these intense yet invaluable classes. A master class is a class given to students of a particular discipline by an expert of that discipline. In our case, that's music! The difference between a normal class and a master class is typically the setup. In a master class, all the students (and often spectators) watch and listen as the master takes one student at a time. The student (typically intermediate or advanced, depending on the status of the master) usually performs a single piece which they have prepared, and the master will give them advice on how to play it, often including anecdotes about the composer, demonstrations of how to play certain passages, and admonitions of common technical errors. The student is then usually expected to play the piece again, in light of the master's comments, and the student may be asked to play a passage repeatedly to attain perfection. Normally, an artist will work with three or four students and the class lasts approximately two hours. These master classes are held at various venues, from university recital halls to library auditoriums. The master classes are attended by other students and the public is always welcome. For large or small student groups, guest artists come to schools to present short performances with engaging Q-and-A sessions. Sometimes, students are invited to the concert venue to watch open rehearsals that are often follwed with Q-and-A sessions with the musicians. Tuesday Musical can provide funding to help cover bus transportation costs for student groups. Our guest artists teach, perform and inspire during multi-day visits to K-12 schools, universities and other venues. Our guest artists teach, perform and inspire during multi-day visits to K-12 schools, universities, retirement communities, libraries, workplaces and other venues. For example, the acclaimed Escher String Quartet, Tuesday Musical's ensemble-in-residence, visits 3-4 times each season to work closely with students, perform, and share the gift of music throughout our region. Young members develop their music skills, perform for peers, and participate in regional competitions. Membership in Brahms Allegro is open to students from K-12. Members are encouraged to play for each other if they so desire. A relaxed atmosphere helps students to become more comfortable performing for people. Members of Brahms Allegro are eligible to participate in the Ohio Federation of Music Clubs’ annual Junior Music Festival and Junior Composers Contest. Brahms Allegro members receive vouchers for free tickets to all Tuesday Musical concerts. If you know a student who might be interested please contact Cheryl Boigegrain for more information at cimprovise@aol.com. We help cover the cost of bus/van transportation for schools or groups bringing 20 or more students to any of our concerts and educational opportunities. We help cover the cost of bus/van transportation for schools or groups bringing 20 or more students to any of our concerts and educational opportunities. Please call the Tuesday Musical office at 330-761-3460 or e-mail us. An antidote to workplace stress, our Decompression Chamber brings free concerts to hospitals, factories, government offices, social service agencies, and other high-pressure environments. Research shows that classical music can decrease stress, boost brain function, improve productivity, increase physical performance, and sharpen memory. Each Decompression Chamber concert lasts approximately 45 minutes. They happen in lunch rooms, public lobbies, offices and other spaces where employees and clients can come and go. For more information: 330-761-3460 or info@tuesdaymusical.org. Together with schools and teachers, we're integrating the arts to enhance student learning. Recognizing our commitment to arts education, Tuesday Musical has has been chosen to join this prestigious and powerful program of The John F. Kennedy Center for the Performing Arts in Washington, D.C.
We're part of a team that includes the Tri-County Educational Service Center, Wayne Center for the Arts, and the College of Wooster. Nationwide there are approximately 100 partnership teams in nearly 40 states and the District of Columbia. Our team is providing professional arts learning opportunities for teachers throughout northeast Ohio as a way to increase the artistic literacy of young people. Slide the year box to the right to see past scholarship winners.